The Arkansas Derby could be called the Rebel Stakes II with six runners from the runner-up through the seventh-place finisher seeking a reversal of fortune against the winner — The Factor. The son of War Front is indeed the main factor in the $1 million Grade 1 on Saturday at Oaklawn Park, where on March 19 he dominated eight rivals, winning at 1 1/16 miles by 6 ¼ lengths. The Arkansas Derby, which might have a full field, is 1 1/8 miles, the same distance as the Wood Memorial that proved too much for Uncle Mo in his first attempt going longer than 8 ½ furlongs. The Factor is in the same boat. If he wins, he likely will be the Kentucky Derby favorite. If not, the odds will go up like Uncle Mo’s. Before shipping to Arkansas, The Factor worked six furlongs handily in 1:12 1/5 on Sunday at Santa Anita. 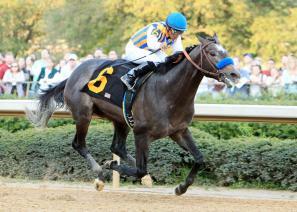 He “worked great,” said trainer Bob Baffert, who has a slew of horses with their sights set on Louisville. Rebel runner-up Caleb’s Posse, victorious in the Smarty Jones, breezed five furlongs in 1:02 at Oaklawn on April 8. On Tuesday, third-placer Archarcharch, who captured the Southwest, traveled a half-mile in 50 4/5. Elite Alex, who ran fourth to Pants on Fire in the Louisiana Derby at nine furlongs, will be one of four horses adding blinkers, after recording a bullet 1:11 3/5 with them, on April 6 for six furlongs at Oaklawn. The others are Sway Away, sixth in the Rebel, and J P’s Gusto, seventh in that race, plus Brethren, third in the Tampa Bay Derby, who posted a bullet 59 seconds for five furlongs last Saturday at the Palm Meadows training facility. Elite Alex has been sort of a buzz horse this year, but troubled trips kept him out of the winner’s circle in three outings. The son of Afleet Alex reared at the start of his sophomore debut and suffered a minor hoof injury, and then finished second to Alternation in a competitive allowance contest. Alternation was a late scratch in the Rebel when the son of Distorted Humor skinned his left front leg and sat down at the post. The $750,000 Blue Grass likely will have a full field, but only one 3-year-old in a long time won a prep in Kentucky and smelled the roses – Charismatic, who captured the 1999 Lexington Stakes at Keeneland. However, Street Sense was second in the Grade 1 Blue Grass on the synthetic surface before visiting the winner’s circle at Churchill Downs. Thunder Gulch ran fourth on the dirt in ’95 before taking the Kentucky Derby. The last double winner was Strike the Gold in ’91. The buzz colt in Saturday’s renewal is Santiva, runner-up to Mucho Macho Man in the Risen Star at Fair Grounds a couple of months ago that has been training well at Palm Meadows. Last October, the son of Giant’s Causeway finished second in the Breeders’ Futurity at Keeneland before taking the Kentucky Jockey Club at Churchill Downs. His main rivals in a fairly wide open 1 1/8-mile contest have plenty of experience on the turf, but not on the Polytrack. Crimson China broke his maiden on the Gulfstream Park grass course at 1 1/8 miles in February and was second in the Rushway on Turfway’s synthetic surface. King Congie broke his maiden on grass and followed that up with two more victories on South Florida turf courses, but was disqualified from first to third in his last score. Wilcox Inn finished third in the BC Juvenile Turf behind Pluck and Soldat and was the Grindstone runner-up on the Fair Grounds grass last month. Queen’splatekitten ran second in a Gulfstream allowance turf race before capturing the Palm Beach on grass.